Great product. I pack everything I need for seting the targets for training. Excelente producto y de buena calidad, muy practico, totalmente recomendable. Ottimo: è il terzo che prendo (per dei colleghi). Non costa molto e oltre alle carte ha tre utili tasche per inserire la cucitrice, i punti e i nastri per tappare. 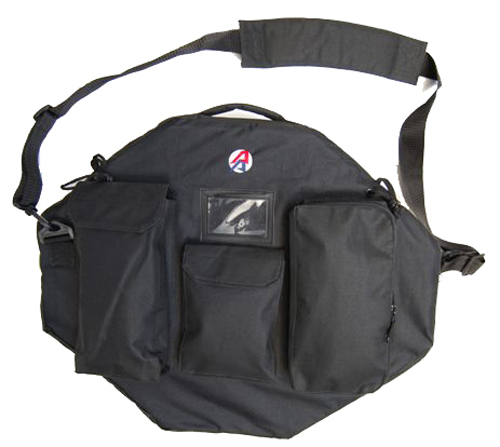 Useful product, frees up space in range bag and also helps you organize so you know you have everything for IPSC shooting. Would give it full marks except as other reviewers commented it could be just a big larger to make sliding in targets easier. I would add maybe even using a wider and stretchable fabric on the edges that the zips are sewed to so that more or fewer targets can use carried snugly but still easier to load into the bag. An additional pocket for timer would be good too. Had looked at this for some time: it's one of those product-ideas that can seem a little over the top, a luxury almost. Well put that idea away immediately: this is a superb piece of kit. As pointed out in previous review, I too became fed up of targets flying all over the car and falling out of the boot on arrival at range. This bag is so well made, so obviously designed by someone who shoots, and priced so competitively as to make it one of the greatest hidden secrets of shooting. By utilising all the front pouches, this bag has in real terms freed up two main pouches in my pistol bag. There's a lot to be said for "everything in one place". The bag can live in the car comfortably, which means the added benefit of not turning up at the range and finding the staple gun has no staples (how many times have you done that, or with patches too) This is a piece of kit which falls under the banner " how on earth did I get by without one of these until now?" Buy one, you wont be disappointed. The DAA IPSC Target Bag is the best. No more targets floating around my vehicle. It frees up lots of valuable space in my range bag. The Target Bag neatly stores my Speed-Patcher, spare tape, stapler, spare staples, and lot of targets. It even has a pocket for my range card and business cards. In addition to the handle, it has a shoulder strap, so it can be swung to my back, and free up my hands. 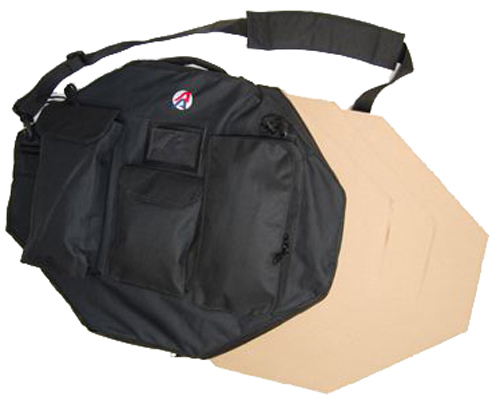 An operating tip I will pass on to make your experience of owning the DAA IPSC Target Bag, even more pleasurable, is that I find it easiest to slide targets in and out of the bag when it is standing upright. That way the weight of patcher, stapler and supplies is not on the targets. Mooie stevige tas waar je je kaarten en andere dingen in op kunt bergen. Heb een paar tassen gekocht voor anderen en dien zijn zeer tervreden over dit product DAA KLASSE. Great bag to bring targets, stapler and tape to the range. All is in one place, so I never forget any of it. But i have to agree with the other reviewer that it should be slightly larger, maybe just 1-2cm would be enough. As it is now, new targets will fit fine, but used targets that have been stapled and shot up a little can be tricky to fit into it. And we tend to reuse practice targets as long as possible. The bag is well worth the money in my opinion.